I stand by my closing statement on my previous review - "I would definitely return" - and I did! 8 pumps of real ale at the bar plus the extra 2 at the side I noticed were ciders. On this visit there was an older friendly chap serving who poured the pint perfectly. I had a pint of Thunderbridge Stout 5.2% at £3.70. A great pint. Visited back in April early evening during the week. 8 pumps face you at the bar, 7 of which were on. There may also have been 2 more pumps round the corner but I didn't check them out to see if they were duplicates or additional ales. A variety of light, dark and fruit ales on offer. I went for a pint of Irish Red or something similarly named, 4.5% at £3.40 for the pint. A tasty pint but it looked like the young barmaid didn't enjoy spilling beer down the glass onto her hands, which resulted in lack of top up and the head being a bit bigger than might normally be deemed acceptable. I didn't have the heart to ask for a topup though. At the time of my visit there were 3 or 4 young student types serving, very pleasant and welcoming. There was plenty of seating, the pub itself is pleasant, main room in front of the bar and a separate yet semi open room to the side with a fireplace. The pub itself was pleasant, old traditional bar in dark wood and stained glass. Recently taken over by Camerons and badged as part of their Head of Steam chain. They've spent a lot of money restoring the interior, and as a result this is a seriously nice traditional boozer. Decent range of real ales, too. Well worth a look. Was very impressed by this pub. 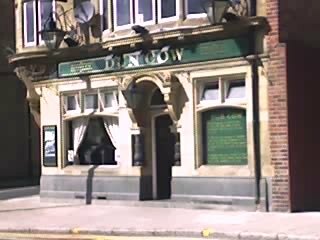 We had walked here from the Butcher's Arms at the other end of the High Street (not listed on here, but home to the Bull Lane Brewery) and we found the Dun Cow to be a better and much busier pub. It has a wonderful interior and has recently been taken over by the Head of Steam chain. Ales were Camerons Strongarm, Sonnet 43 India Pale Ale & Steam Beer, Tyne Bank Single Blonde & Hand Drawn Monkey What Would Jephers Do. Cider was Sandford Orchards Devon Mist. Music was a bit too loud for my liking. But then, this place is next to several other town centre locations where loud music seems to be the norm. Was impressed by this pub. Well worth a visit. Beautiful interior, friendly welcome, well kept real ale.